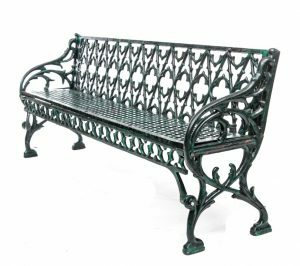 Gothic style cast iron garden benches, a set of Art Deco dining chairs made in Paris around 1927, a pair of brass bound peat buckets and a Sevres style porcelain writing slope all feature at Mealy’s sale in Castlecomer on July 31. 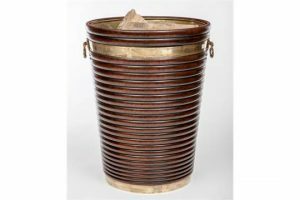 Irish brass bound peat buckets are always in demand by collectors and there are two in this sale, estimated respectively at 2,000-2,200 and 2,000-2,500. 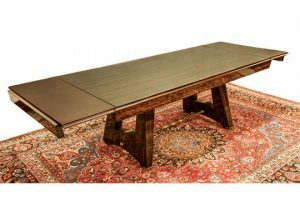 The top furniture lot is an oblong French Art Deco macassar ebony dining table (c1925-30) by Dominique Andre Domin and Marcel Genevriere. It is estimated at 8,000-12,000. There is a set of eight Art Deco dining chairs by Andre Arbus (3,000-5,000) and a heavily carved Chinese side table (2,000-3,000) among a furniture offering which includes side tables, chairs, sideboards, breakfast and dining tables and a pair of satinwood demi lune commodes (2,800-3,500). Art includes a large bronze study of a wounded stag by Holme Cardwell (1813-1897) (2,500-3,500), a coastal scene by George Drummond Fish (250-300) and a number of Irish and English School works. There is porcelain, rugs, a set of four pewter tankards, a scale model of the Titanic, clocks and miniatures on offer. 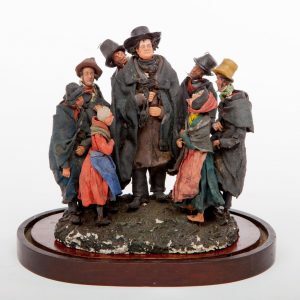 An unusual composition group of Daniel O’Connell meeting a group of catholics clad in local costume is the catalogue cover lot for for Mealy’s mid-summer sale in Castlecomer on July 31 at 11 am. On an oval base under a glass dome it is estimated at 500-800. Among the other collectible items on offer is a scale painted wooden model of the Titanic in red, white and black (500-550) and a heavy copper and brass mounted divers helmet on a wooden base (380-450). A set of French Art Deco dining chairs is estimated at 3,000-5,000 and an Art Deco macassar ebony dining table with two extension leaves has an estimate of 8,000-15,000. Viewing gets underway in Castlecomer today for this one day auction of over 600 lots. 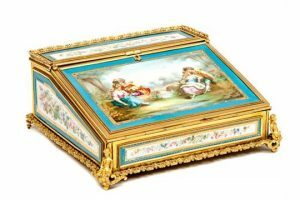 It will include fine and decorative art, antique furniture, garden furniture and interiors from a variety of private estates and collections. The catalogue is online. The Lusitania telegraph recovered from the sea bed yesterday. 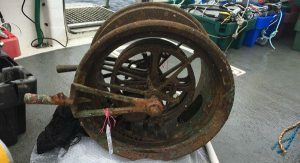 The main telegraph machine from the wreck of the Lusitania was recovered yesterday from the seabed off County Cork. It was brought to the surface in good condition under the supervision of an archaeologist from the Irish National Monuments Service. It had been relocated by recreational divers, who marked its position on the seabed. The Cunarder, the largest ship in the world when built on the Clyde, was torpedoed by a German U-boat off the coast of Co Cork on May 7 1915, with the loss of 1,201 lives. It was en route from New York to Liverpool. The sinking has been cited as factor in the US’s eventual entry into the First World War. The wreck, 11 nautical miles off the Old Head of Kinsale, is regarded as a war grave and protected by an Underwater Heritage Order under Ireland’s National Monuments Acts. The owner of wreck Gregg Bemis intends to place the telegraph, and the pedestal successfully recovered last year, on display in a local museum, along with other artefacts he has recovered during earlier dives. A painting by Kenneth Webb was the top lot at Fonsie Mealy’s summer art sale in Castlecomer this year. 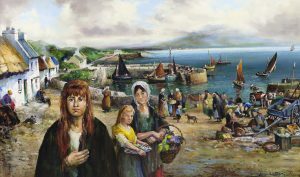 The Fish Market at Roundstone sold for a hammer price of 15,000. 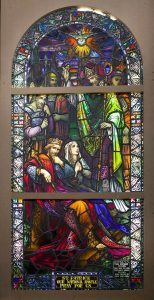 A set of four stained glass panels of saints from The Earley Studios in Dublin sold for 11,000 at hammer. 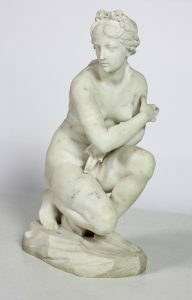 A 17th century Italian School of Moses Striking the Rock attributed to Bernardo Cavilling made 10,500 at hammer and The Crouching Venus, a white marble Italian School c1800 sculpture originally at Powerscourt sold for 8,000 at hammer. Other top hammer prices included a pair of Irish duelling pistols (8,000), a 12 bore Purdey shotgun (5,600), a stained glass panel of St. Patrick (5,500), an oval enamel plaque portrait by J. Sadler, Liverpool (5,200), two Carrara marble statues of The Blessed Virgin and The Sacred Heart (5,000) and an Irish George III period bookcase (5,000). Beyond Boundaries: Avant-Garde Masterworks from a European Collection will come up at Christie’s during the second half of 2017 in New York, Geneva, and Paris. The collection is expected to achieve around $30,000,000 and comprises around 180 works from five categories: Impressionist and Modern Art, Post-War and Contemporary Art, Magnificent Jewels, African Art and Design. The Modern and Post-War works of art were assembled with the guidance of renowned advisor Alain Tarica, who also advised Yves Saint Laurent and Pierre Bergé as well as Hubertus and Renate Wald for their collections. This collection is led by Wassily Kandinsky’s Improvisation mit Pferden (Studie für Improvisation 20) which is estimated between $10,000,000 and 15,000,000, and executed in 1911, the year Kandinsky realised the first abstract painting in history. Guillaume Cerutti, CEO of Christie’s said: “This collection is without doubt one of the greatest moments of the autumn season. Not only because this group of around 180 works, comprising design, modern art, jewellery and some African sculptures is of the highest quality and refinement, but also because this collection has a soul, a unique spirit. It is obvious that every object has been chosen with passion and with an extraordinary liberty by this couple of collectors. The result is a beautiful testimony for dialogue between arts and styles”. The images above displays, from left to right, Wassily Kandinsky – Improvisation mit Pferden; Yves Klein – Monogold: Hemba Figure – Democratic Republic of Congo and Marc Newsom – Pod of Drawers. 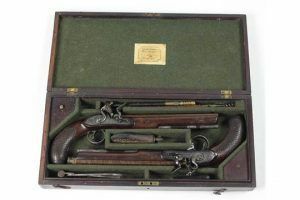 A cased pair of early 19th century Irish flintlock duelling pistols by McDermot, Dublin sold for 8,000 at the opening day of Fonsie Mealy’s two day sale in Castlecomer today. A late 18th century Irish George III flintlock blunderbuss by Rigby, Dublin sold for 2,100 at hammer and a similar vintage blunderbuss by G. Pepper, Dublin made 1,600. 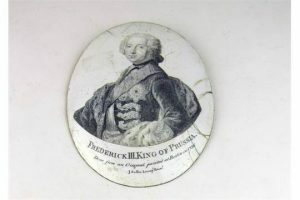 A large oval enamel plaque portrait of Frederick III, King of Prussia estimated at 150-200 sold for a hammer price of 5,200. It was from the collection of Senator George Sigerson from his dispersal sale by Battersby and Co. in July 1925 and thence by descent through the Humphries family. The sale continues tomorrow. Historic stained glass from the Convent of Mercy in Castletownbere, Ernest Bewley’s desk and a white marble crouching Venus once at Powerscourt House are among the lots to tempt collectors at Fonsie Mealy’s two day sale in Castlecomer on July 25 and 26. The prime piece from among eight stained glass panels is entitled St. Patrick Our National Apostle. Estimated at 4,000-6,000 it depicts King Loegaire, son of Niall of the Nine Hostages, King of Pagans and Barbarians, being baptised and received into the catholic church. 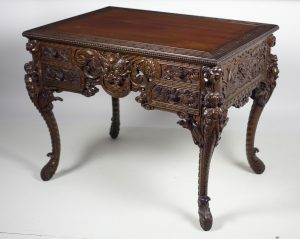 It was made by Earley and Company (1861-1975), one of the largest ecclesiastical decorators in Ireland and the UK. The rest of the eight panels depict various saints, Our Lady and the Sacred Heart with estimates from 700 to 6,000. Lot 550 is a late 19th century Chinese export wooden desk owned and used by Ernest Bewley, founder of the eponymous oriental cafes. It is estimated at 2,000-3,000. The catalogue cover lot is an Italian crouching Venus which was in the Great Salon at Powerscourt in the 1800’s. Powerscourt and most of its contents were destroyed by fire in 1974. It is estimated at 7,000-9,000. A bag once nearly thrown out with the rubbish sold for $1.8 million at Sotheby’s in New York. It was the one Neil Armstrong used to collect the first ever samples of the moon. 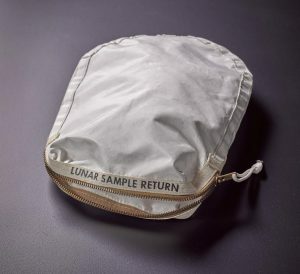 The outer decontamination bag, which was flown to the moon on Apollo 11 and still carries traces of moon dust and small rock, was sold on the 48th anniversary of the first moon landing in 1969. Auctioneer Joe Dunning introduced the lot as “an exceptionally rare artifact from mankind’s greatest achievement.” It sold to an anonymous buyer on the telephone following a sluggish five-minute bidding war. Its previous owner was an Illinois lawyer, who bought it in 2015 for $995. One of the greatest compositions by George Frederic Watts, ‘England’s Michelangelo’ sold for £320,750 at Sotheby’s sale of Victorian, Pre-Raphaelite and British Impressionist art in London. 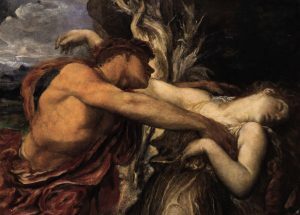 Orpheus and Eurydice remained in Watts’ possession until his death in 1904 when it was inherited by his adopted daughter Lilian. The romantic subject matter may have been inspired by the emotions Watts was experiencing following the breakdown of his first marriage to the young actress Ellen Terry, resulting in their separation after only eleven months. 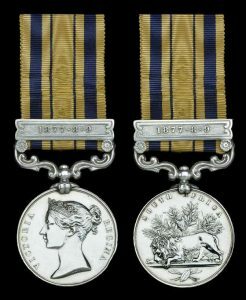 The Zulu War medal awarded to Corporal James Bushe. The Zulu War medal awarded to Dublin Corporal James Bushe made £72,000 at Dix Noonan Webb in London today. It went to an internet bidder. The estimate was £40,000-50,000 and it was knocked down for a hammer price of £60,000. This becomes £72,000 with commission. Cpl Bushe was one of 16 Irishmen known to have taken part in the defence of Rorke’s Drift – the former trading post of Irish merchant James Rorke – when a 150 strong garrison held off an advance by 4,000 Zulu’s in 1879. He suffered a nose wound from a bullet that killed one of his comrades, but later served in the Mediterranean, India and Burma. A tailor by trade he enlisted in 1870 at the age of 18. He was discharged from the army in 1891 and his later history is unknown. The Zulu War medal awarded to another Irishman, Michael Minihan, made £84,000 at Dix Noonan Webb last December. This was a record for a Rorke’s Drift defender who was not awarded the VC.